In this final article on Spiritual Warfare, much of the focus will be on the solutions and effective methods for gaining victory that I have personally used while being attacked. Always remember, Jesus has already won the victory on the cross. Furthermore, we know already that Jesus has won the war but there are still everyday battles to be fought. Most importantly, there is nothing to fear for those who have accepted Jesus Christ as their Savior. The first part of this final article are some Characteristics of Demons. It would be completely foolish to seek out the enemy, but when the enemy comes to attack you – it is of great benefit to know your enemy and their tactics. The next section are the solutions to help you in battle which are taken from my very own personal experiences. Finally there are three tips for anyone who unfortunately has to encounter a very real direct attack. Demons are individual intelligent beings: They are very smart and very deceptive. Demons each have their own personality: All are pure evil. Demons obey their master Satan: They are very well organized and for the most part operate in teams. They are against anything representative of God-they are pure evil-the complete opposite to God. Demons have no mercy whatsoever: A demon will never ever show any mercy to it’s victim. Period. Demons are liars: There is no truth in them. Never engage in a conversation with a demon. Demons thrive on FEAR: They get great satisfaction from causing fear. Demons for the most part are unseen: Personally speaking, I can see them more clearly in videos. Interestingly some people cannot see them no matter how clear they appear. It is truly supernatural. Demons can enter into almost anything: I’ve personally seen them enter trees, birds (mainly crows from my personal experience), even insects! Believe it or not, I saw a demonic head come out of a spider on film. Of course, we also know they can enter people. They can NEVER enter a true believers spirit, the Holy Spirit lives there. Demons gain more victory on the weak: Many murders are committed by people who yield to the demonic influences. Demons can speak audibly: In a prior posting, I mentioned how a demon kept repeatedly saying to me, “I am your friend.” They can also speak telepathically. Demons can manipulate a person’s emotions: At some points when I was being attacked, they tried to make me feel sorry for them. Demons can cause sickness: I.e. mimic epilepsy and various diseases. Demons can cause mental illness: They literally try to drive a person insane, i.e. hearing voices, seeing manifestations (i.e. schizophrenia? ), some Obsessive Compulsive Disorder (O.C.D), etc. Demons can manipulate physical objects: I.e. slamming a door, opening a drawer etc. Demons can oppress a true believer in Jesus Christ: Oppression means that they are attacking the person from the outside. Demons can possess a person: Whether or not they can possess a true believer is quite controversial. I think that some of those flatly refuse to even discuss the possibility have not had any personal experiences themselves. Speaking from my experience, I think it maybe possible that a demon could possess a believer’s body but most definitely NOT their spirit because only the Holy Spirit lives there. Demons can sexually assault: Both males and females in perverse ways. Demons can attack a person through a television or computer screen: I think that the Antichrist will use the television to reach the masses (I can’t help but wonder about the mandatory switch to digital). Demons can try to attack a believer’s ability to pray: If they do try to do this, keep on trying to pray. Never give up. God is ALL POWERFUL. Demons watch people: I.e. watchers. Demons can change their appearance: They can appear as a deceased loved one etc. Demons pass along forbidden knowledge: Personally, I do think the government especially has received advances in military technology from demons. Demons can literally infest music: For example, research “Stair Way to Heaven” by Led Zeppelin played backwards. From John Todd’s testimony, whom for the record I believe was the real deal, witches cast spells to put the demons into the actual master recordings- from the master recording, the demons are then transferred to every copy of that master. We may be exposing ourselves to some of this every time we turn on our radio or play certain music. Apparently this still goes on today. Demons will try to affect a person’s sleep: If they are attacking a person, they will try to wear that person down through lack of sleep. Once the individual is sleep deprived, it becomes harder to pray to God and therefore their attacks become more effective. It becomes a destructive cycle. Demons tremble in fear at the name of Jesus Christ: They tremble from a believer who knows the authority they have In Jesus. Reading the Bible on a daily basis is critically important. When these attacks first began, I absolutely knew that the Bible was totally true. I would “cling” to the Bible on a daily basis. Now I’m not saying any of this to boast about how much I read the Bible. I’m saying this as true testimony that it really helps! Unfortunately so many people don’t know what a wealth of information that God has given us in His word. The WORD is alive! If only some people would dust-off their Bible and start reading it-you truly get to know God more every time. It never gets old! The Holy Scriptures are “God Breathed.” I highly recommend a believer to get into a routine. When I read the Bible, I DO NOT read it like an ordinary book. I read it as the TRUTH. I KNOW that it is the TRUTH. Isn’t it amazing that there is something that you can actually dive wholeheartedly into! The Bible is 100% good. Normally, I read just before sleeping. I don’t schedule a certain amount of time, or a certain number of chapters etc. I also like to pray and get a fairly clear understanding of where God wants me to read next. For example, recently I read Revelations. Then I felt like I was being guided to the Gospel of John, then before I even finished John-I felt like I was being guided to Romans. That’s just an example, but I leave it to God to guide me where to read next. You could just ask God the obvious question, “God, where would you like me to read next?” Sin does get in the way of Bible reading. We all sin, so what do you do? Confess it to God, ask for forgiveness and MOVE ON! Reading the Bible on a daily basis helps to nurture our relationship with God and also helps to keep the enemy at bay. If you do not have a Bible, today is the day to get one! Prayer is very important! A true believer has been justified by what Jesus has done-therefore, we should pray IN JESUS’ name BECAUSE we are IN JESUS and Jesus is in us. It’s ALL about Jesus! God does not answer my prayer or your prayer because you or I are righteous. We are NOT righteous! We are merely DECLARED to be righteous because we are IN JESUS! So when God the Father sees us, we are covered with the righteousness of His Son Jesus who has applied HIS blood to take away our sins forever. Again, God doesn’t listen to my prayer because I’m a nice guy and deserving. NONE of us are deserving! Not one of us is righteous. We are DECLARED righteous BECAUSE of what Jesus has done and because we have received Jesus’ death on our behalf. So finally, when God listens to our prayer, it is because a true believer is IN Christ Jesus. Probably the best advice I can give someone is to pray in Jesus’ name. First address God the Father. Second, give Him thanks and praise. Third, tell Him what’s on your mind in your own words. God WILL listen to you because you are In Christ. When I pray, and I’m guilty of not praying as much as I should, it is not a request every single time. A believer is adopted into God’s family when they are born-again. Therefore, He is our Father. Talk to Him in your own words and avoid repetitive meaningless prayer. Approach Him with respect-but tell Him what’s on your mind. Unload any worries upon Him-He can handle it. God wants a close relationship with each of His children. What an amazing God! Solution 3: Pleading the precious blood of Jesus Christ. Remember, I’m telling you from my personal first-hand experience. For months, I was attacked on an almost daily basis. Again, they really center their attacks on the actual head area, even more specifically-the frontal lobe. None of this will work for a non-believer in Jesus Christ. A non-believer has no power or authority over these evil beings whatsoever. If you are reading this right now, and you feel the Lord drawing you to Him, go immediately to read the top of this blog and accept Jesus Christ as your personal savior or call on Him in your own words. Pleading the precious blood of Jesus is for a true believer only. I can testify that it has certainly helped for me. I’m not saying that the demonic attacks have completely stopped. However, they have become less frequent. Furthermore, pleading the blood of Jesus can be used as preventative measures even if you are not being currently attacked. Let me give you a quick example, as crazy as it may sound: I had demon possessed crows appearing almost everywhere I went. The crows first appeared when I created a hole in my hedge of protection by filming so-called “aliens” which of course are actually deceiving demons. These crows would appear on my property “squawking” at me. I had crows fly right up to my picture window! I’d see them almost every time I went for a drive, a walk etc. It was complete harassment. Again, they try to drive a person insane. So what happened to demon possessed crows that were coming onto my property-even so much as flying right up to the picture window directly in front of me? They stopped coming onto my property (for the most part). That’s correct. It worked, and they stopped coming onto my property like before. Now, don’t be mistaken, on a few occasions they would fly onto a tree on my property and immediately I would start praying-and they would fly away-usually to a neighbors property. The majority of the time they will be on my neighbors property and not my own. I don’t want to give the impression that you pray this once and it immediately stops forever. That’s not how these attacks work. I have seen instantaneous results on a few occasions (i.e. direct attacks)-but typically the attacks come in “waves” and will lessen over time (based on your obedience to the Lord). You can do this same prayer or make one of your own. I’ll give you another valuable piece of information: when I pray this, I picture in my mind Jesus’ precious blood covering all of the areas that I have mentioned. I try to pray this prayer at least once a month. The key is to rely on Jesus and never ever quit! Solution 4: Put on the Whole Armour of God. 10Finally, be strong in the Lord and in the strength of his might. 11Put on the whole armor of God, that you may be able to stand against the schemes of the devil. 12For we do not wrestle against flesh and blood, but against the rulers, against the authorities, against the cosmic powers over this present darkness, against the spiritual forces of evil in the heavenly places. 13Therefore take up the whole armor of God, that you may be able to withstand in the evil day, and having done all, to stand firm. 14Stand therefore, having fastened on the belt of truth, and having put on the breastplate of righteousness, 15and, as shoes for your feet, having put on the readiness given by the gospel of peace. 16In all circumstances take up the shield of faith, with which you can extinguish all the flaming darts of the evil one; 17and take the helmet of salvation, and the sword of the Spirit, which is the word of God, 18praying at all times in the Spirit, with all prayer and supplication. To that end keep alert with all perseverance, making supplication for all thesaints, 19and also for me, that words may be given to me in opening my mouth boldly to proclaim the mystery of the gospel, 20for which I am an ambassador in chains, that I may declare it boldly, as I ought to speak. Solution 5: The Power of Jesus’ Name. Using Jesus’ name is the most effective and simplest solution of them all during a direct attack by the demonic. Demons tremble at that sound of Jesus’ name. There is only one prerequisite to using Jesus’ name in spiritual warfare: FAITH. If an individual is using Jesus’ name without faith, it will not be effective. You need faith, even the size of a mustard seed as Lord Jesus has told us. There have been a few occasions when I needed Jesus’ help immediately. On these occasions, the enemy was not using some elusive attack but rather a direct attack. In all of these cases, they have occurred at night when I was in a “sleepy state” and the most vulnerable. During one attack, they pulled me out of my body. I was travelling upwards at a high rate of speed. After calling twice to my wife unsuccessfully, I finally screamed “Jesus!” – this instantly ended the attack and I was once again back in my body. I’ll describe another very recent attack where Jesus’ name proved beyond any doubt to be completely effective. My wife and I were sleeping. Suddenly, I felt a direct attack in the region of my (middle and lower) chest and (upper) stomach area. This attack came out of nowhere. It was so strong it woke me up. The instant that I felt this attack, my wife, who was still sleeping beside me, began to speak in Latin or Greek. Of course, my wife does not know any Latin or Greek! I struggled to speak. It felt like they were trying to prevent me from trying to use Jesus’ name. I was finally able to say something like, “Go in Jesus name”! As with the other attack, Jesus’ name brought it to a quick end. When I say quick, I mean instantaneous. I’m telling you that the second I say “Jesus!”, the attack is over! All praise to Jesus! I’ll give you a few helpful tips in case you ever run into a similar situation. First, they will try to physically prevent you from being able to say something like, “I command you to leave in Jesus’ name and never return!” My advice from personal experience, is to try to say “Jesus” first. These attacks are very real and it can be a physical struggle to even speak. Calling His name, “Jesus”, will most likely stop the attack instantly. Again, I’m giving you practical advice here. If for some reason the attack doesn’t end the first time, keep saying His name: “Jesus! Jesus! Jesus!” until it stops. Where I’ve gone wrong during these attacks is trying to use too many words when I’m struggling to even speak. Also, I’ve learned that your wife’s or husband’s name will not help you! My second helpful tip is to not engage in any dialogue whatsoever with a demon. I’ve had a demon tell say to me “I am your friend.” Now, what benefit would it have been to engage in a conversation with that demon? What could I have said, “Oh really? Tell me all about how you are my friend.” The truth is that demons are liars and deceivers. There is no benefit to engage in a conversation with an evil being that hates you to it’s core because you are created in the image of God. Do not be deceived, demons do hate every single human despite whether that human serves God or Satan. Furthermore, if a demon is speaking, as in the attack where it used my wifes’ vocal chords, do not let it continue. In that incident, the demon was only able to get out probably one sentence before I was able to cut it off by using the power of Jesus’ name. If I did not cut if off, the demon would have continued to speak using her as the instrument and who knows what else would have happened. Stop it immediately. There is absolutely no benefit or knowledge to be gained from listening to a demon. Stop the demon immediately in it’s tracks. There is no fear for those In Christ. When I first began experiencing demonic attacks, I lived in a complete state of fear. I was terrified! On one night I was so scared- I slept with a light on! Only through slowly maturing as a Christian and knowing my full authority In Jesus, have I come to have no fear of these very real, very evil beings. Knowing that Jesus Christ is the living Son of God who will protect you is all you need. These demons thrive on fear. In fact, once a true believer in Jesus who is being attacked stops fearing them, they will see the attacks diminish substantially. I’m telling you this from my personal experience. Spiritual Warfare is real. There is a very real battle going on where billions of souls are at stake. Unfortunately thousands upon thousands of people all over the world are dying everyday and ending up eternally separated from God because they did not accept Lord Jesus as their personal Savior while they were alive. They died without knowing Him. The free gift of salvation through Jesus Christ was there for the taking but for whatever reason they did not accept Him. For those lost souls, Satan and his demons were able to keep those people deceived during their lifetime. Can you imagine the regret for those who lived a long time on this earth- decades upon decades- and never called upon Jesus to save them? Now they are lost for eternity. Damned. In all the time they wasted, I would imagine they would like one more moment of life to call upon Jesus and be saved. It is too late for them. For those lost souls, Satan and his demons have achieved their goal in taking them with them. Finally, it is my sincere hope that Jesus Christ is glorified through this writing. When one understands how evil Satan and his demons really are- I believe that one can’t help but see the pure goodness and righteousness of Jesus Christ shining through the darkness. Jesus Christ is the living Son of God. If people only knew how much Jesus loves each and everyone of them. It is complete lie from Satan that you and I cannot make any difference in this sinful world. Imagine if you could save just one soul from everlasting torment by sharing the TRUTH of what Jesus has done for us. If you are currently just a bystander- it is time to take action. If you have not accepted Jesus as your Savior- it is this very moment that you have the opportunity to do so. If you are already a true believer- are you actively trying to lead the lost to Jesus Christ to be saved? After having my footage posted for the world to see for several months on the internet, I was advised by my church Pastor and other fellow Christians to destroy everything that I had filmed. There was a time when I wasn’t quite sure whether to keep the footage or destroy it. I had been constantly attacked during the filming process and my footage was also causing some viewers harm as well. I knew that if I was to continue to weigh my options, most likely I would have kept it. To be honest, I still wasn’t sure what God wanted me to do at that point. I knew that I was heavily addicted to filming these evil beings so I figured that my own thinking was probably cloudy. In the end, I decided to take their advice. I really took a leap of faith that I was doing the right thing. Therefore, one night I decided not to think about it any longer and I completely deleted three months of work in a matter of seconds. I still had my latest footage on disc-weeks later I deleted that as well. Finally, months after that, I came across some more clips that I had missed on my computer. Those clips were deleted as well. Deleting all of my footage was extremely difficult. It was hours upon hours of time spent not just filming but posting them as well. At the time, I had around 40 videos posted. Before I had even deleted the clips, I knew that I was destroying the proof that some people would need to believe my story. I knew that without the evidence to back up my story, certain people would not be satisfied until they had seen what I had filmed. To no surprise whatsoever, I’ve certainly had comments stating that it is “convenient” that the footage is destroyed. I do completely understand this reasoning; remember, I needed proof myself! However, they’ll have to find it for themselves; just as I did. Unfortunately, there is no way for me to please those people-quite frankly, I don’t even try anymore. Sure, I could go out and film these beings again at this very moment. The Lord knows I’ve been tempted on countless occasions to this very day. However, the Bible clearly states to stay away from evil, “Stay away from every kind of evil.” 1 Thessalonians 5:22 It doesn’t get much more direct than that! After much thought, I’ve decided to write this article. Without actually showing any footage, this is the closest I can take you outside into the dark night with me to film these evil beings. I’ve tried to include smaller details that I’ve never mentioned before. Although I had plenty of daytime footage, I chose one specific night where they appeared so clear on film and it is etched into my memory. I’ve always appreciated small details in true stories written by others. As always, I try to make this story as accurate and truthful as I possibly can. I don’t want you to just see what I had seen-I want you to be able to smell the fresh summer evening air. Finally, I must give clear WARNING: Do not attempt any filming of these beings or any other paranormal activity whatsoever! It would be absolutely foolish. Always remember the brief Bible quote mentioned above: Stay away from evil! This is extremely serious and should absolutely never be treated as a game. You can learn from my prior experiences without doing it yourself. Furthermore, I have purposely left out critical information that is needed to get them on film. Again, I’ve omitted this information simply because one does not realize the dangers of filming until they begin-and then it’s too late. I opened the screen door and stepped out into the August summer air. It was the summer of 2008. It was a beautiful night with virtually no breeze. It was a quiet evening, with only the sound of crickets and the occasional vehicle passing by on a highway in the distance-and sometimes the sound from the small Beagle next door. I looked around at the trees in my backyard that lightly guarded the other houses in behind them. The lights from those same houses provided the perfect amount of brightness to shine through and prevent total darkness. Without those lights, I knew my footage would be so dark that it would be useless. My new hammock, which I had received for my birthday months before, was positioned perfectly between two trees. I had my eye on those same trees before we had even purchased the house! I pulled up a chair on the patio and sat in the dark. I never kept on my own houselights for the simple reason that I didn’t want my neighbours to get the wrong impression. I was concerned that from a distance, it would appear as if I was some kind of pervert filming into their houses! Of course, I wasn’t filming into their houses-I was filming into the trees in-between. The stars were shining in the sky and I could see the moon and some clouds. I placed the camcorder on my lap until I decided to begin filming. I wanted to take a moment to study my surroundings. I looked at the street light to my left on the next street over. I looked at the numerous trees- Maples and Evergreens. I looked at the house directly behind the trees. I viewed the house to its right with the house lights on at its back door. I turned my head further and saw the other streetlight. Finally, I looked at the house almost to the direct right side of my own. Although my property is a decent size, the astonishing fact in all of this is that I’m located in a new subdivision that has many homes. All day I was being constantly “urged” to film. This desire was coming directly from them. They were turning this filming into an addiction-an obsession. I knew that they were around me. I could feel their attacks. I wasn’t sure if they could read my thoughts but I knew for certain that they could see everything that I did. I could feel them trying to get into my head; literally. They were indeed trying to possess me. It is difficult to describe, but I could physically feel them trying to claw their way into my head. Again, I would actually feel physical clawing and crawling sensations on the top of my head. It’s very true that demons do battle a person in their mind. Despite these constant attacks, like a fool I was too caught up in this mind-blowing experience. I had worked all day. Now, it was my time to participate in this new hobby of mine. This new hobby that was completely dangerous and wrong. I was quickly starting to realize that there was virtually no difference between filming these so-called “alien” beings and participating in witchcraft. In fact, I thought to myself many times that I’ve probably seen more than those who have dedicated their entire lives to darkness; then again, maybe not. I was always anxious before I would go outside to film. My heart would start beating faster and my adrenaline would kick-in. I was literally opening the door to the unknown. There were no two days of filming that were exactly the same. I had an idea of what to expect, but I never knew for sure what would appear before me. All I had was the camcorder and some basic amateur skill on how to use it. It was the actual demons that would create the “show.” This was the real deal. There was nothing at all fake about the incredible footage I was capturing. Throughout my life, I had considered myself a believer in “God.” For the first half of my life, I had attended Catholic Mass fairly often. I knew about the Father, Son, and Holy Ghost (Holy Trinity). I was baptised as an infant and I completed Confirmation when I was older. I can remember my mother teaching me at an early age the “Hail Mary” through constant repetition. For the most part, I didn’t think I was a bad person. I wasn’t particularly proud of the last decade of my life. I had slowly slipped into sinful behaviours as many young people do. I will readily admit that I was starting to think that there was no justice for the evil doers. My in-depth study of WWII, particularly Nazi Germany, lead me to believe that people like Hitler simply evaded justice and “got away with it.” The moral decline within me began with a slippery slope that was frightening when viewed from a distance. I had fallen far. I sometimes even doubted God’s existence. I can remember giving a former girlfriend a book on Buddha just a few years before (after I was saved by Jesus, I did contact her to tell her to throw the book in the garbage). With that being said, I never participated in witchcraft or anything like that. My weakness was books, shows, and movies about basically anything paranormal. During those years, it never even entered my mind that I could go anywhere other than heaven when I died. I thought that, overall, I was a good person who attended church on occasion and was going to heaven. It’s frightening in hindsight to know that I thought I was saved even though I don’t think that I was at that time. I opened up the viewfinder on the camcorder. I then began to scan the trees. It was such a simple technique. Before I had ever started filming these beings myself, I had learned the technique from an expert at catching these evil beings on film. I had watched his videos for weeks prior. Sometimes I wouldn’t see anything in the clip at first. I would keep watching it over and over again. The key was really continuous “pausing” and “rewinding” to see them. He had the videos posted for the world to see. I saw some amazing footage: I saw a “grey” head come out of a spider on film. I saw the “grey’s” come out of tall trees. I had seen some footage taken during the daytime in his backyard and they “greys” were moving their heads in the footage which actually moved the tree branch above them. In another video I saw one head peek around a transformer at the top of a streetlight pole. In another, I saw two “greys” clearly from footage he shot of a car mirror! I saw numerous “grey” faces in the reflections of a house window. I saw some night footage of countless “greys” in the trees below where he was filming-there were so many that their heads appeared to be attached in the footage; they appeared to be literally overlapping each other. I saw a helicopter in his footage that a “grey” head came out of the side of the helicopter-very bizarre. I saw the “grey” heads come out of birds. I recall one eerie seen of a house brightly decorated for Christmas and “grey” heads peering from behind this supposedly pleasant scene. As unbelievable as it may sound, this is only a fraction of what I had seen of his footage. The result of viewing this footage was the appearance of crows that had not been notably present before I had ever looked at his videos. The first footage that I was able to take wasn’t as good as his-but I kept watching and studying like a student getting ready for the final exams. Or like an artist who was fine tuning his craft. Don’t get me wrong, it was still amazing footage-I just wanted to get as good as he was. I also kept asking him questions. Finally, he gave me the secret to his technique. I think he held out from giving me this secret technique on purpose to maintain his competitive edge. However, once given, this secret technique allowed me to go from mediocre footage to incredible footage. It was like comparing basic cable to High Definition (HD). I went from guessing where they would be to knowing where I would find them. I could now film them basically at anytime. It didn’t matter if it was day or night-but they appeared much clearer in the night footage. I knew the right environment that is essential to getting them on film-consistently. It just happened that my property had the perfect conditions for filming. As mentioned earlier, they appeared in different positions every night so there wasn’t a need to change locations-it simply didn’t matter that it was the same location. Their black almond-shaped eyes are the first thing that I would search for. Consistently, time and time again, the eyes seem to be always the same shape. I would continue to scan for a brief moment and then I would find them. There they were…watching me from the darkness. At that very moment I could see how someone could just instantly lose their sanity. I still find it hard to believe that these beings have been watching my every move during my entire life and I didn’t know they were there. Did you ever have the feeling of being watched but nobody was there? There is a possibility that you were being watched-by these evil beings. Thanks to God, now I’m able to see the very beings that have been watching me. My heart began beating faster in my chest and it almost became an adrenaline rush-definitely an addiction. Again, I try to cope with the fact that for years prior, I had a fear of these evil beings but I had never known for sure that they were around me. I could never understand why I had such a horrible fear of “aliens”. All of my knowledge had come from some books and mainstream media. Now, there they were right in front of me-and I could see them clearly. They make no sound during any of this filming that I am able to hear. As I pan the video camera, they are all watching me. Every single one of them had their eyes fixated on me. It’s like I am on stage with numerous demonic beings in the trees as the audience. I’m sure there were even countless more of them out there. However, I would choose the best area to capture them on film. Unfortunately, these demonic beings do not watch only me. I can guarantee you, and I’m only stating this to make you aware, similar demonic beings have watched you over the course of your entire life. They have seen your birth to most likely this very moment as you read this very sentence. They know what books you read, what television shows you view, what websites you visit; everything you do when you think nobody is watching. They are constantly watching us and know everything about us. Ultimately, they know every single word that you speak and action that you take. You may not be able to see them-but I can assure you that they are there. They probably know us better than we know ourselves-based on our outward behaviour. They know and understand our weaknesses-certainly not because they care; for the reason of using our weaknesses to their advantage. They know the areas in our lives where we struggle with sin. Fortunately, God watches over us and desires to protect us from evil. God is Holy. God will not allow Satan and these evil beings to test us beyond what we have the ability to handle. If you haven’t read the book of Job in the Bible, I highly recommend it. In the book of Job, there are a few glimpses of what can occur behind the scenes. It took some courage and/or stupidity to be sitting alone in the darkness filming demons. For all I really knew- anything could have happened. My backyard would become a virtual circus of paranormal activity-because my filming opened the door to them. I had created a hole in my hedge of protection from God. For years I had studied the alien/UFO phenomenon. I had seen countless movies and documentaries. I used to believe that they were real “aliens” before all of this started happening! I knew the stories concerning abductions and various encounters. However, the reality of the situation-taken from my very real and truthful first-hand experiences was nothing like I was lead to believe from various authors and filmmakers. My true story is absolutely nothing like I was lead to believe from those countless stories that I once believed. Those authors and filmmakers only keep applying the layers upon layers of lies spread by Satan about this “alien” lie-whether they know it or not. Quite frankly, I can’t help but to think that many of them know exactly whom they serve. As I pressed the “record” button, I would estimate that their approximate distance from my house would be 60 to 80 ft. away. This of course is from a human perspective! While filming these beings, I learned fairly early on to throw out what I previously “thought” can happen and cannot happen concerning “physics” and “reality” as I had known it. Think about it for a moment. Can you imagine thinking of the world as what you are able to see and then suddenly realizing that there is a whole other unseen world behind the scenes? It is mind-blowing. It is shocking. There were some days after filming that I thought I was going to have a heart attack or nervous breakdown. Truthfully, on one occasion I contacted the person who I learned to film these evil beings off of and asked him if he could really see these things in my footage. On that day, I was in such a mess that I was hoping this wasn’t all true. Of course he confirmed that he most definitely could see them and started discussing certain “greys” in the footage. Seeing how real these beings are-I still am trying to cope. In fact, I would not be surprised if I suffer from some Post Traumatic Stress (PTSD) due to witnessing these real experiences. “13 And I saw three evil spirits that looked like frogs leap from the mouths of the dragon, the beast, and the false prophet. 14 They are demonic spirits who work miracles and go out to all the rulers of the world to gather them for battle against the Lord on that great judgment day of God the Almighty. 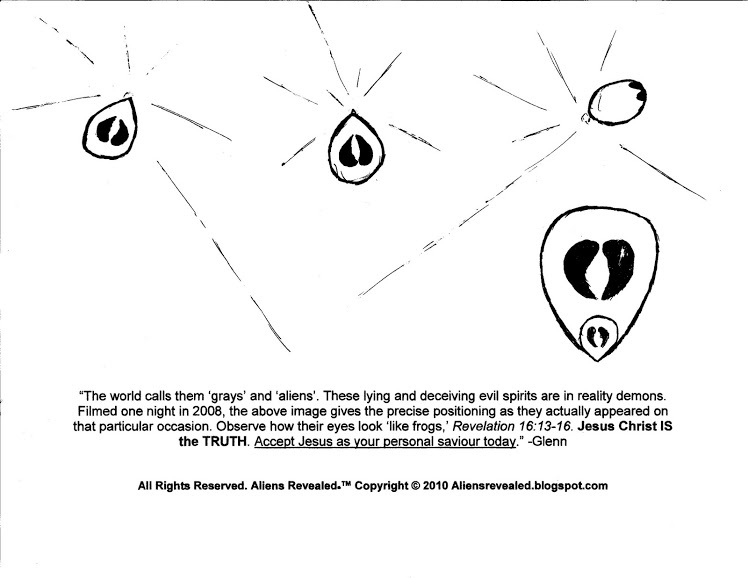 Concerning the actual footage taken, it is difficult to describe the intertwining of our physical world combined with the largely unseen supernatural spiritual world-with the end result being demonic spirits captured on our physical devices. This fact helps explain how these demons are able to literally attack and start harassing anyone who was to view the footage. This actually occurred several times to people who viewed the footage that I had taken (the same way that I was harassed at first from watching his footage). In a way, and I don’t pretend to fully understand, the demons are able to bind themselves to the footage. To clarify even further, it is almost like they are “presently conscious” in the footage even though it is a “past event.” I fully realize how far-fetched some of this sounds but often the truth is stranger than fiction-I think many would agree that this topic is no exception. Whether they are “presently conscious” in the footage or not, regardless, people who watch the footage open the floodgates to a demonic assault. As mentioned earlier, they create a hole in their hedge of protection from God. Furthermore, I have had numerous people tell me that this sounds very similar to the motion picture “The Ring.” I have to admit that I did think of that movie at the time myself. In an extremely general sense, I do agree with these people. I guess it’s the same premise: a person watches certain footage and then is attacked by evil. However, the attacks didn’t happen by seeing them coming out of the screen like in the movie. The reality of the demonic harassment was simply not quite as dramatic as the movie. Nonetheless, I can tell you with absolute certainty that a person can be attacked from watching this kind of demonic footage. As the song states, be careful little eyes what you see. As I continued to look into the distinctive black almond-shaped eyes of these beings, there was never any question as to what type of being they really were. There I was, alone in the dark, with every single one of these beings focused upon me as I stared right back at them. They were demons. There was never any doubt as to what they were once this all began. As mentioned, for years various forms of media had me almost completely fooled into believing the satanic lie of “aliens.” In fact, during that time I didn’t think that I’d ever find out the truth until I died! Of course, now I know that it would have been too late-as always, my thanks to the Lord for showing me the TRUTH. There they were, a short distance away- and I’m staring at the very same beings that almost had me deceived and on the path to destruction like so many others who are caught in their web of lies. These beings were using me as an instrument. It took me months to figure out why they would continue to let me film them when I was clearly telling people they were demons. I would post the video for the world to see and I would always expose their lie. But after months I realized the reason why: the reason they continued to want me to film them was because it didn’t matter what I had to say. People ask me to show them the footage of the so-called “aliens.” There are no aliens. They are demons! There are many people who have been so brainwashed by the media that they cannot seem to understand the “alien” lie. The demons knew that the people viewing the footage would make up their own minds. Furthermore, through supernatural methods, these being most likely could assist the viewers into making up “their own minds.” It was clearly proven to me that these beings can directly attack the people who viewed the footage. Therefore, it was the actual footage that held the power. Nothing that I was going to say about it would stop them. As I started recording a second clip that night, I thought about how ancient these evil beings really are. Sitting there, I could just feel the evil flowing from these beings. It was hard to describe. Even some of the most evil human beings can sometimes show small amounts of mercy to their victims-even if it’s just to kill their victim more quickly. Not with these evil beings. There is no good whatsoever within these beings. They do have varying degrees of evil compared to each other-but there is no mercy. Only complete darkness. There is no light within these beings. Witnessing these beings in person, there is also absolutely no question as to what they are: demons. I do thank God for giving me no doubts or illusions to the real identity of these beings. I thought about how many lives these very same demons destroyed. These beings have been around for thousands of years. How many souls did they keep deceived from the TRUTH of Jesus Christ until that person took their last breath and then it was too late? How many human beings did they possess or influence to cause murder? Over the course of thousands of years, would it be hundreds of murders or thousands? Millions? How many people did these very same demons that were now watching me-drive to commit suicide? How many husbands and wives did they tempt to commit adultery? How many families over thousands of years did they break-up and destroy? How many people did these very same demons tempt to try drugs? How many lives did they ruin through mental and physical illnesses and disease? I also had the thought that Jesus Himself could have cast one of these very same demons out of someone that is mentioned in the Bible; although it is entirely possible, it is probably unlikely because I would estimate that there are millions upon millions of these evil beings. In fact, if there are demons watching everyone on earth, there would have to be billions! This is speculation on my part-I can’t say for sure, but again, in some of the footage I’ve seen there are so many that they were literally overlapping each other. As the eye contact continued, I knew that God is always in absolute control. Thankfully, these beings are only allowed to go as far as God will permit them. If God were not in total control, I’m sure I’d already be dead. These beings would have killed me that very moment if they could. But they could not. As mentioned earlier, it appeared that they were “frozen” and unable to move. I had never seen God during these experiences, or any heavenly angels for that matter. However, one cannot wonder what is supernaturally holding these beings in place and preventing them from killing me in an instant if they were permitted? There has to be some goodness holding these beings in place and preventing them from doing their own evil will. I can only assume that this unseen presence keeping these evil beings restrained is God at work. More specifically, it may be the Holy Spirit in action. I cringe when I consider the fact that these very same beings will be let loose during the Tribulation period. What a horrific time that will be for those who will be left behind. I continued to record short clips for approximately the next hour. Then I closed the viewfinder to my camcorder. As I rose from the chair, I opened the screen door and entered my kitchen. It was always a relief when I returned safely inside. I honestly never knew what was going to happen or what could happen. For instance, I remember one night being very frightened by what I saw in my footage after I was safely inside. In that particular evening’s footage, I saw something very large in the darkness pass directly in front of me. It was a huge black shadowy figure. Of course, it was evil and demonic, but I never knew it passed that close to me while I was out there. If I had of known, I would have left in a hurry! This blackness that passed in front of me was so large that it completely covered the lights in the background. In the footage, I could see it slowly moving from my left to my right. A part of me knew that I’m crazy to put myself at risk to go outside to film these beings. On the other hand, I was so absorbed with the amazing footage that I was filming. I finalize the disc and go to a computer. One of the most exciting moments in all of this was when I uploaded a new video of the footage that I had just shot and it became live-ready for the world to see. Satan likes to keep his lies in different compartments. This of course is to deceive people into believing that the Bible is not all encompassing. The living Word of God is not just confined to a book but rather flows continuously into our daily lives. The Holy Spirit is constantly trying to draw people to the absolute TRUTH of Jesus Christ. It’s amazing how Satan blinds certain people to the point of becoming outraged when I mention Jesus’ name in the same articles on so-called “aliens”. Do you remember when I mentioned that demons have watched you since your birth? This is how Satan uses another popular deception of “ghosts.” Let’s say for example that a “ghost” appears to you and it’s your deceased Grandfather. Let’s also assume that you knew your Grandfather quite well for many years before he died. You knew his subtle gestures, the way he spoke, his posture, how he held a cigarette, how he walked with a limp etc. Demons observed all of his gestures and personal characteristics over the course of his entire life. It’s not hard to imagine how they can imitate your Grandfather to a “T” when they watched him 24/7 for 77 years! They knew his gestures better than he did! Humans do not linger around on earth because they haven’t chosen to go “into the light” after death. That is a complete lie. When a person dies they are gone to one of two places and they are not coming back. Again, they are gone. If you ever have a “ghost” appear to you, I can guarantee you 100% that you are being visited by a demon (also called devils, evil spirits, or unclean spirits in the Bible). Do you recall when I mentioned that I knew “about” the Father, His Son Jesus, and the Holy Spirit? There is a world of difference in knowing “about” them and accepting Jesus Christ as your personal Saviour and trusting in Him alone for your salvation. It is the difference between spending eternity in Heaven or Hell. My wife, whom I’m certain was guided by the Holy Spirit, told me about this very verse mentioned above while we were driving down the highway one day after work. That specific verse really made a real impact on me. Doing “good works” will not save a person because we cannot earn our way to Heaven. Believing in “God” in a general sense will not save a person. Even believing the historical fact that Jesus Christ existed will not save a person from hell! Going to church will not save you! Trusting in Mary, Jesus’ earthly mother, will not save you! So what will save a person from eternal torment and separation from God? Calling upon Jesus Christ as your personal Saviour and trusting in Him alone will save a person. We are saved by believing that Jesus took our place on the cross to pay for our sins even though He was sinless. Salvation is simply receiving what Jesus did on the cross for us and trusting in nothing else to save you- don’t even trust giving someone a cup of water to save you! Jesus paid for our sins with His precious blood. Jesus paid the debt of our sins in full. Know that Jesus Christ IS God (Holy Trinity). Know that Jesus proved that everything He said was absolutely true when He rose from the dead on the third day. God knows everything about us and desires us to draw close to Him (Omniscience). God is everywhere around you as you read this very line (Omnipresence). Finally, God is in complete control (Omnipotence). Isn’t it reassuring that God is in complete control over everything? God is good!